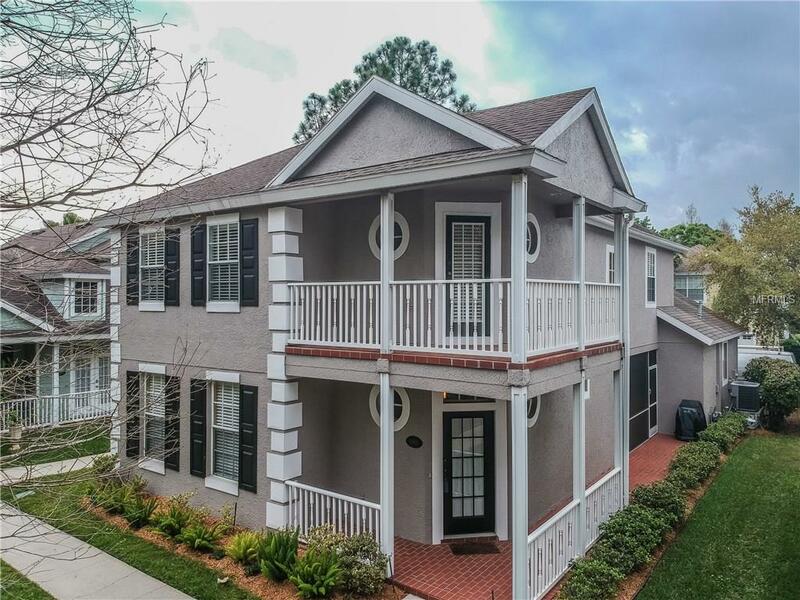 Fabulous Single Family LOW MAINTENANCE home in GATED Vineyards, a coveted suburb of WESTCHASE. This beautiful home features 3 BRs, 2.5 BAs, 2CG + MODERN, OPEN floorplan w/versatility for all your needs. Pass thru the arched trellis covered w/jasmine to the end of the path to this charming home w/FRONT PORCH facing PRIVATE Conservation. Round vestibule entry w/decorative columns welcomes you home! LARGE open FAMILY Rm includes space for a FORMAL Dining Rm table. SPACIOUS Kitchen boast TONS of counter space & cabinet storage space, WOOD Cabinetry, GRANITE counter tops, COOKING Island with 4-Burner with Griddle GAS cooktop, Dual Oven features smaller oven for quick, economical cooking or multiple meals at same time just perfect for all your entertaining needs. Enjoy friends & family in this INVITING Kitchen for get together around the island & at the Breakfast Bar. Spill out into and enjoy the Florida, OUTDOOR lifestyle in your SCREENED PORCH or SECOND OPEN Patio both off the Kitchen. Guest Half BA & Super storage under the stairs. Upstairs there's an EXQUISITE Master Bedroom w/cozy SITTING Area & door to BALCONY, Walk-In closet + En-Suite Bath. Master BA features private water closet, DUAL VANITY, Garden Tub & separate Shower Stall. The Vineyards offers PRIVATE Pool but also access to Westchases amenities. Vineyards low maintenance lifestyle includes yard & sprinkler maintenance + gate security. Owners maintain exterior of home, inc. roof. HVAC replaced in 2012. Make your appointment today! Additional Lease Restrictions 1 Year Lease Approval Required.